Mohamed Al-Jabali, the editor of Akhbaralasr news website is the latest casualty in a wave of intimidations targeting bloggers and online journalists in Yemen. In a statement made yesterday, Al-Jabali appealed for protection after receiving death threats in the capital Sanaa from the regime's security apparatus. This comes just after his website was also hacked. 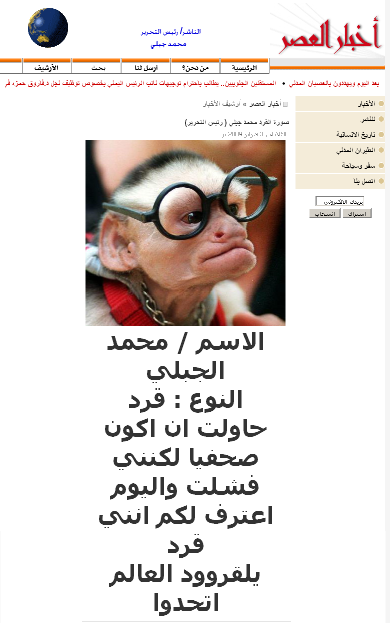 The hackers, whom Al-Jabali said are elements of the regime, published a sarcastic entry on the front page with a picture of a monkey and an insult on the owner of the website Al-Jabali. Al-Jabali said the regime was angered by his online reports on peaceful anti-government political activities in the Tihama region in the West of the country. The website had articles critical of the regime's handling of the economy and a recent article highlighted a call to end the ‘national investment mafias’ in the country. I'm writing to you while feeling threatened by imprisonment… I appeal to you to help protect my life as I feel I'm in danger.” Al-Jabali said in an email statement today. It is worth noting that Al-Jabali's case is not the first of its kind in Yemen. Several other online journalists and bloggers have also been exposed to similar acts of intimidation and the attackers remain at large. 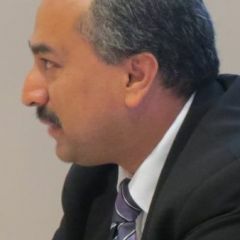 The journalist community had often expressed grave concerns about increasing attacks in number and intensity by the country's security apparatus to curb anti-regime writings. Despite many appeals by the Yemeni Journalists Syndicate and international advocacy organizations such as the Committee to Protect Journalists, Article 19, and others, attacks against journalists including online journalists remained on the rise. It is widely believed that websites that contained content critical of the regime were attacked systematically by individuals paid for by the regime to so as to limit the oppositional voices on the Internet. Among the frequent methods used to harass online journalists and websites is censorship of websites, physical attacks and death threats by phone or in person. 2- Bypass the local gateways and work from external servers. 3- Be careful with the local computers security. Democracy is losing its meanings if freedom is not granted.